I love pineapple and thought a combination of pumpkin and pineapple would be great. I was right! 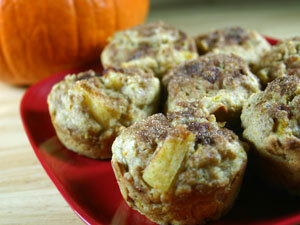 These pumpkin pineapple muffins are moist and sweet. These muffins don’t have a speck of butter, believe it or not. The pineapple and pumpkin make them moist and the olive oil lends the necessary fat. Once you combine the wet and dry ingredients, make sure you don’t beat the batter, you just want to gently blend it. Overmixing yields tough muffins. Make sure all of the dry ingredients have been moistened and then stop stirring. I have a dough whisk from King Arthur Flour that I adore and highly recommend. If you’re like me and don’t use a lot of buttermilk, the powdered variety works fine in this recipe. Just add the dry buttermilk to the dry ingredients and the water to the wet ingredients. These muffins make a great portable breakfast, a tasty afternoon snack, or a nice side dish for pork or chicken. I think next time I’ll try brown sugar and cinnamon on top. Preheat oven to 400°F. Coat a 12-cup muffin tin with cooking spray. In a small bowl, combine ½ Tbsp sugar and ½ tsp cinnamon. Set aside. In a large bowl, whisk together the flours, baking powder, salt plus remaining 1/3 cup sugar and 1½ tsp cinnamon. Set aside. In a medium bowl, whisk the buttermilk, oil, egg substitute, pumpkin, vanilla and orange zest until well blended. Stir in the pineapple. Make a well in the center of the flour mixture, pour in the buttermilk mixture and stir just until blended. 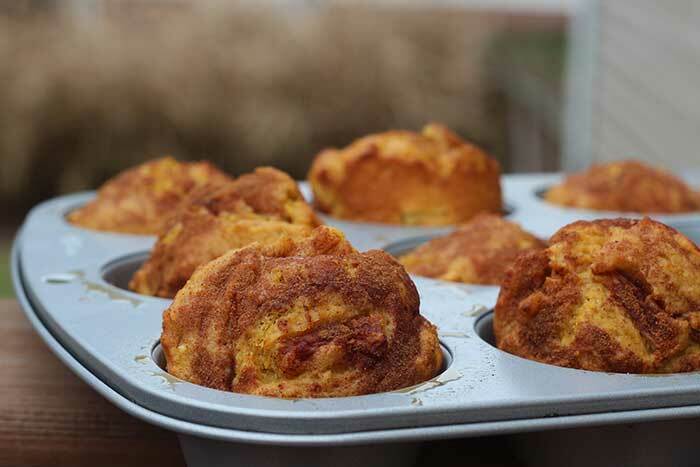 Spoon the batter into the muffin tins, then sprinkle with sugar and cinnamon mixture. Bake 18-20 minutes or until wooden toothpick inserted in center of muffin comes out clean. Remove from tins and cool on wire rack.